We're The Place for You! Brew & Moo for Two! rewarding way to experience Traverse City’s booming craft beer scene. It’s your little passport to the big world of beer in northern Michigan. AND Draft Magazine, named TC one of three Emerging Beer Towns to keep tabs on. You will be welcomed by our Sweet and Salty sampler along with a 6 pk variety pack of Michigan Beers. We will provide you with two TC Ale Trail passports and a map to the local breweries. Enjoy dinner at Boone’s Long Lake Inn or Harrington's By the Bay, both are well known for their great steaks and seafood. ($75.00 gift Card included). The second evening sit back, relax and unwind with a bottle of wine from Leelanau Cellars. This package includes a full made to order breakfast each morning. Whether prefer your drinks straight up, or shake’in and not stirred this package is for you! 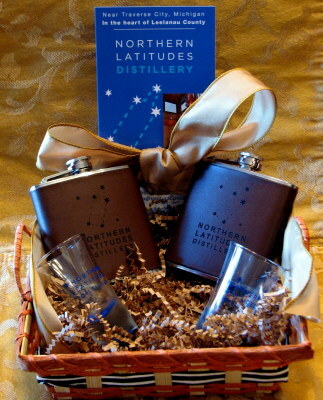 Upon your arrival you’ll receive two Northern Latitude's Distillery leather flasks and shot glasses. the county's outstanding local distilleries. them with your own 2 Ltr Charred White Oak Barrel (included in package). 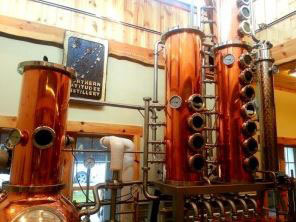 •Northern Latitudes Distillery, in Lake Leelanua is the first full service distillery in a seven county area. Vodka, Mackinaw Island Fudge Liqueur and more! •Blackstar Farms –featuring award winning fruit brandies including apple, cherry, pear, plum and grape to mention just a few. reconstruct the recipe that's been lingering in one of our family heirlooms for three generations. Tour some of the finest Vineyards in Northern Michigan & see why the region is internationally known for its award winning white wines and now its light French-style reds. They are also one of the world’s top producers of ice wine. A bottle of wine from Leelanau Cellars & 2 Lake 'N Pines Lodge Wine glasses along with a sweet and salty sampler await your arrival. The next day, after a full, made to order breakfast, you have reservations for two with the GT Shared Wine Tours- they will pick you up at the lodge for a chauffeured 4 hour tour of 4 to 7 of the local vineyards. Tour from 1:00 pm to 5:00 pm. Leelanau is one of the hidden treasures of Northern Michigan! This package will let you sample some of their finer things! welcome basket with 2 flasks and 2 glass shooters..
County’s first full service distillery. They are the makers of Ice Dunes Vodka , Deer Camp Whiskey and more! Then enjoy the beautiful town of Glen Arbor- next to the Sleeping Bear Dunes. The headquarters of Cherry Republic -Three unique retail locations make up their grounds. cherry products are available for sample and sale, and of course all gift boxing is complimentary. at the M-22 Store - Glen Arbor where you can take home a special bottle of M-22 Wine or other souvenir. The M-22 store (named after road the takes you on a beautiful tour of the Leelanau Peninsula).